A bold visual transformation that happens right before your audiences eyes. Shake the striped scarf and magically change it into a red and a white scarf. Easy to do magic that ideal for services, school assemblies and parties. For Easter, for Christmas for all year round. 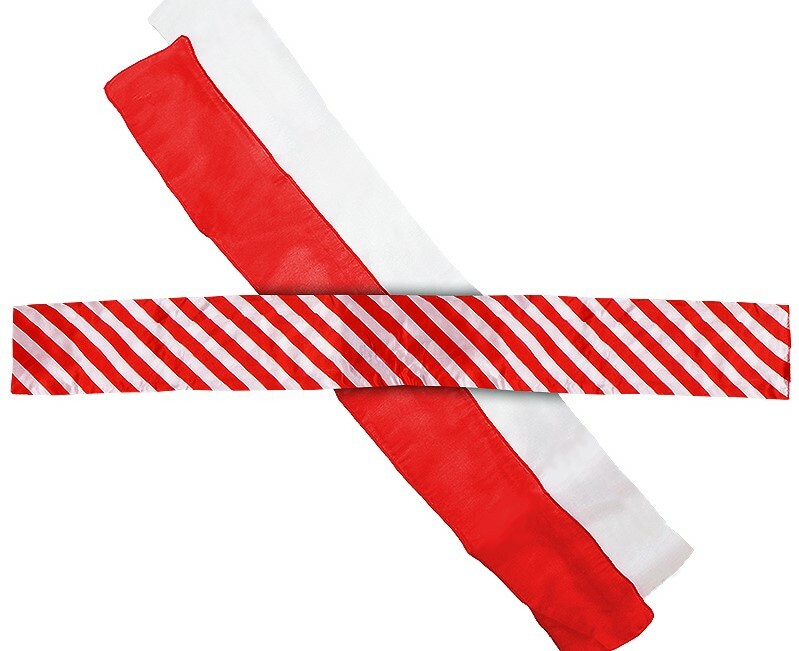 The magician shows a long red and white striped streamer, shaking it in the air it instantly separates into two – one solid white, one solid red! Suprising visual magic that’s ideal for Christmas in such seasonal colours, and also has a powerful Gospel message for Easter and throughout the year. Made of a hard wearing material with a satin feel, much quicker and flashier in operation than if made of silk – the wonders of modern material! A colourful magical transformation that audiences love, and a message they won't forget. - Saint and Sinner - When we are born, we are pure and white (point to white) But we all sin, we make mistakes (point to red) Jesus dies on the cross so that we may be forgiven, and now God comes between us an sin (shake and separate the two colours) We still have to deal with sin in this world, but in Heaven we’ll be pure and white once more. - Earn Your Stripes - Does God only love us if we follow all the rules for example go to church every week. Is this how we earn our stripes, how we earn God’s love? No. God loves us no matter what. And through Jesus' suffering we are healed and forgiven (separate the two streamers). By his stripes we are healed and forgiven. - Sheep and Goats - Life on this world is a mix of good and bad (stripes on the scarf). But in the world to come the sheep are separated from the goats. (Separate the colours).Which group will we be in! - Come on you Reds! - Explain that this is your football scarf and that you support two teams - the Reds and the Whites. After a few football jokes and a football chant you say you need to pick one - you can't have divided loyalties. You magically split the scarf and the audience help you decide on the team. Fun with two volunteers. - Christmas Candy - This is Santa's scarf. It's striped, just like a red and white candy cane. Two elves are feeling the cold, so Santa takes his scarf and magically splits it into two so they can both keep warm. Add a large inflatable candy cane as a wand, a dove pan to magically produce a pile of real candy canes and you have a whole magical routine! - A Leopard Can't change it's spots - but perhaps a Zebra can change it's stripes - What's white and black and red all over - a sun burnt zebra! Classic silk magic that packs small but plays BIG! Wonder Box - Predict, switch, restore and more! Classic - Colour Changing Shoe Laces - DiFatta - It's in your hand 'Oh no it isn't' 'Oh yes it is!' Colour Changing fun that sends a young audience wild!